The thought that fabric captures and holds “memory” excites my imagination. The thought that an old piece of clothing is implanted with stories of the wearer. The thought that a piece of stitched table linen holds within it the secrets of a household. I take the phrase “the fabric of our lives” quite literally. This installation piece has been selected for Excellence in Fibers 2017 and will be exhibited at the San Jose Museum of Quilts and Textiles from 19th October 2018 to 13th January 2019. (Hi)Stories Uncovered – Gillie by Ali Ferguson. Uncovering the story of “Gillie” a schoolmaster in Brighton in the 1920s and his romantic pursuit of Miss Dorothy Ferguson. (Hi)Stories Uncovered – Gillie (detail) by Ali Ferguson. Deconstructed shirt, vintage domestic textiles, threads & haberdashery. Digital print & hand stitch. (Hi)Stories Uncovered – Dorothy by Ali Ferguson. My imagined response from Dorothy, a school mistress in Brighton, to Gillie’s letters. 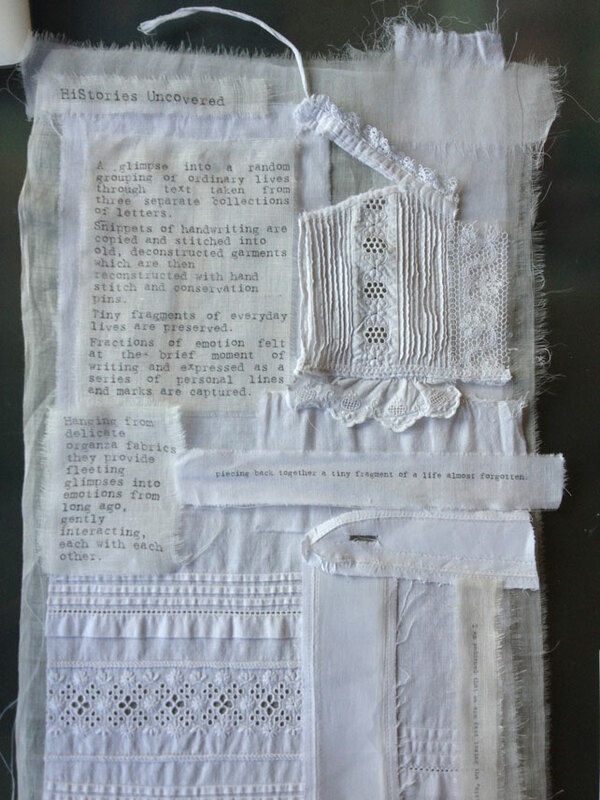 (Hi)Stories Uncovered – Dorothy (detail) by Ali Ferguson. Antique garment pieces, vintage domestic textiles, threads & haberdashery. Digital print & hand stitch. (Hi)Stories Uncovered – Dear Child by Ali Ferguson. Uncovering stories through the letters of a mother to her child. 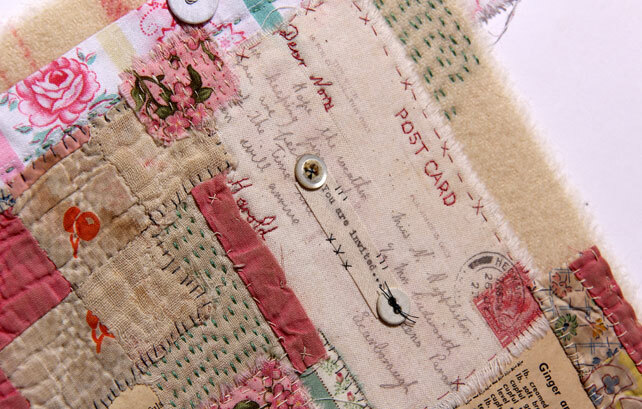 (Hi)Stories Uncovered – Dear Child (detail) by Ali Ferguson. Vintage garment pieces, domestic textiles, threads & haberdashery. Digital print & hand stitch.